Thanks to Dr. Brittany Pakalniskis, University of Washington (USA) for contributing this case. To contribute a Case of the Week, follow the guidelines on our main Case of the Week page. (1) Simply let us know what you think the coolest thing we could add to our website would be, and win a $50 Amazon.com gift certificate! Entering a contest has never been easier! Email us your idea or visit us at the upcoming Las Vegas conferences (ASCP, booth #502 and CAP, booth #217). One entry per person. PathologyOutlines.com staff will determine winner. The winner must provide their name, affiliation or location, and email address and will be announced in our blog and emails. The deadline for submissions is September 30, 2016. (2) Colorblind pathologists interested in a support group, please contact colorblindpathologists@gmail.com. (3) Will you be in Las Vegas this September? We will be! 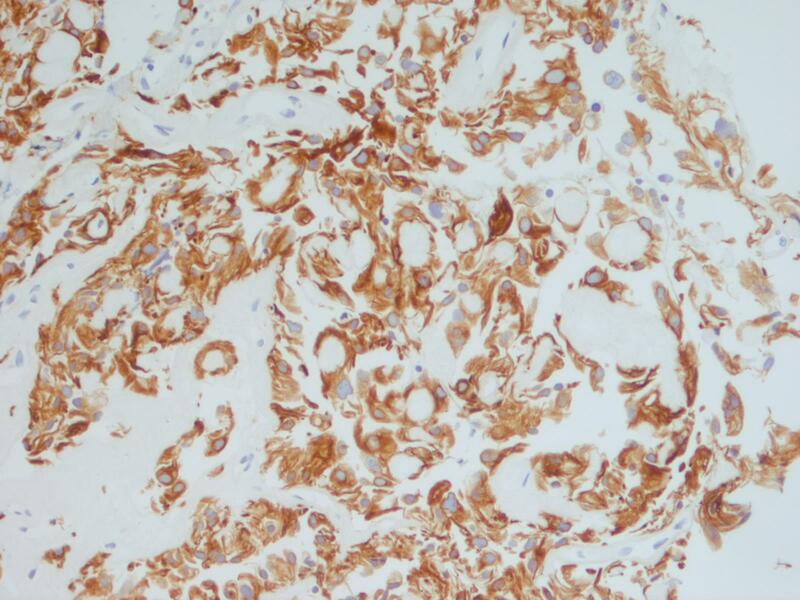 Please stop by to meet Dr. Pernick and other PathologyOutlines.com staff. 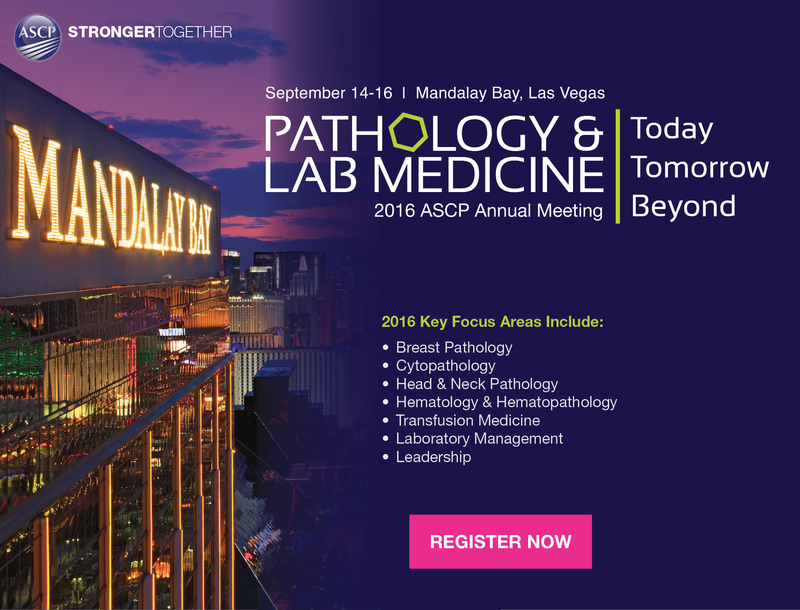 We are exhibiting on September 14-15 at the ASCP conference in the Mandalay Bay hotel, booth #502. We will also be exhibiting at the CAP conference in the Wynn Hotel on September 25-27, booth #217. We will also be giving very nice gifts to the pathologists who fill out a one page survey for us (while supplies last). A 33 year old man presented with a 2 year history of back pain managed by his chiropractor. 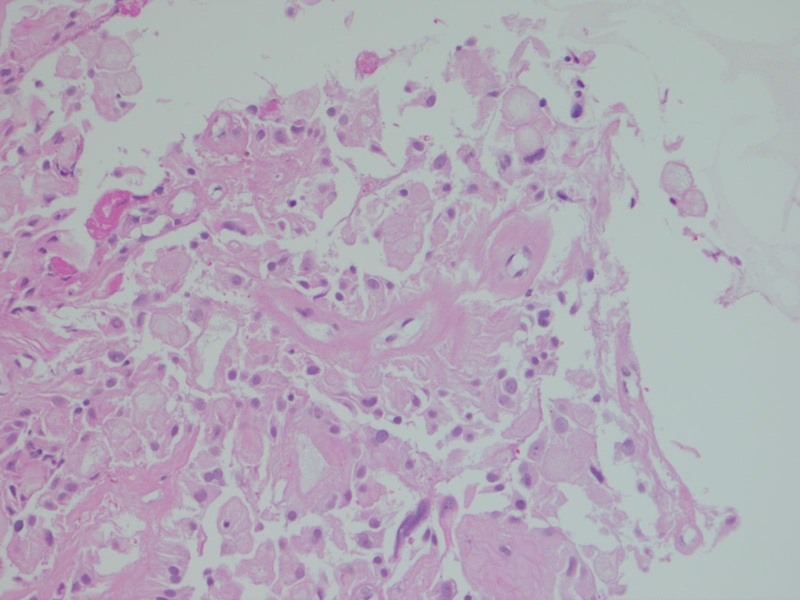 Subsequently, he developed genital numbness, and imaging revealed a large pelvic mass. A core biopsy was obtained, with touch preps to assess adequacy. The radiologist had to core the mass 12 times because each core crumbled into tiny pieces when tissue was extracted from the biopsy needle. The H&E is from the cell block. 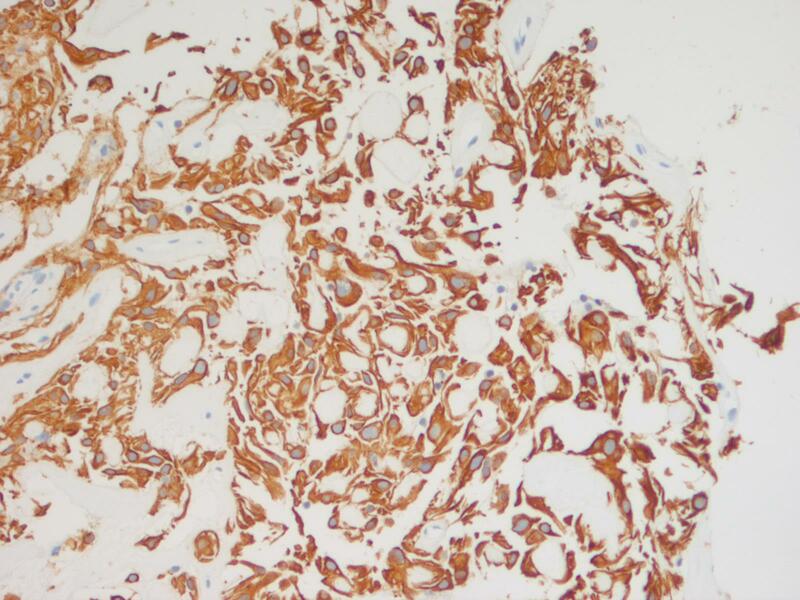 This case beautifully illustrates the cytomorphologic features of a myxopapillary ependymoma, including the characteristic arrangement of cells around a central hyaline core, similar to adenoid cystic carcinoma. Some cells show cytoplasmic processes, another common feature. The nuclei are round, oval or spindle shaped and have fine, open chromatin. Intranuclear inclusions may be present. 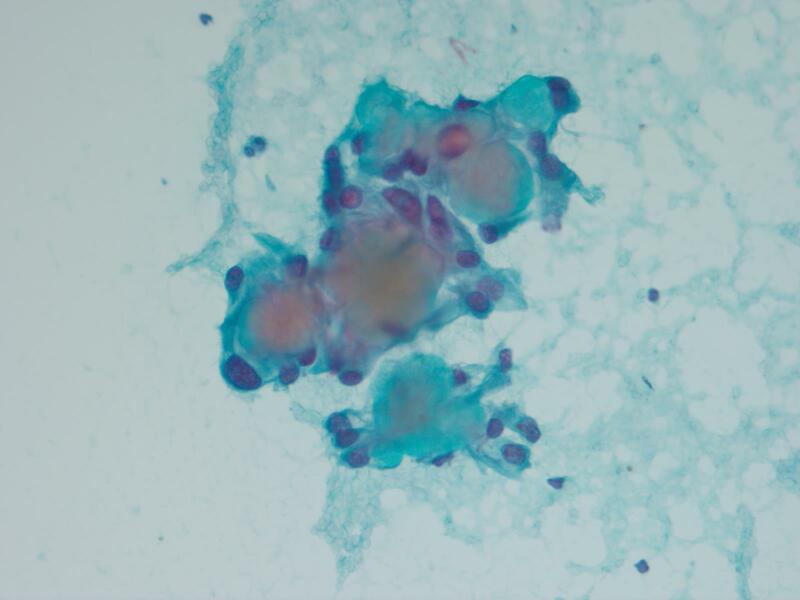 Although the tumors cells are dyshesive, larger intact papillary structures can sometimes be seen. As illustrated in the cell block, globules of mucinous / myxoid substance with central capillaries are another characteristic feature. 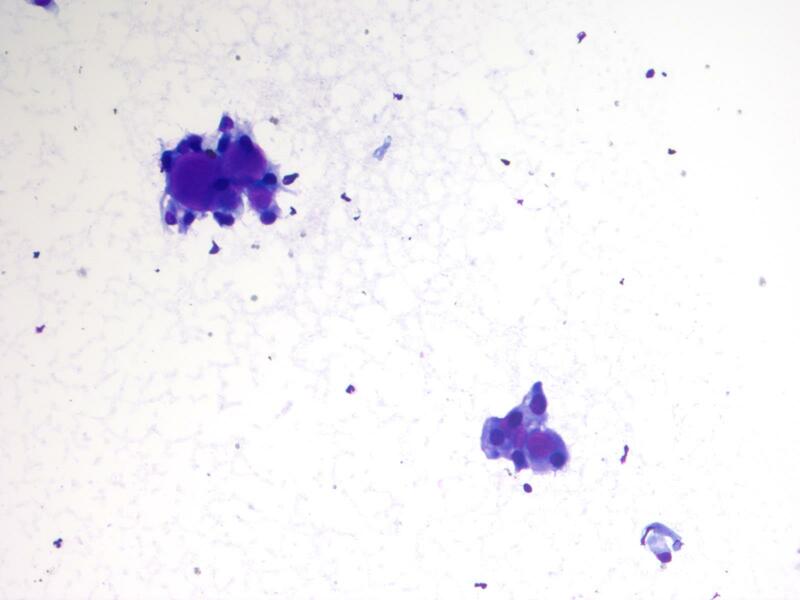 Core biopsies and fine needle aspiration specimens can be grossly mucinous (Demay: The Art & Science of Cytopathology, 2011, 2nd ed, J Cytol 2015;32:42). 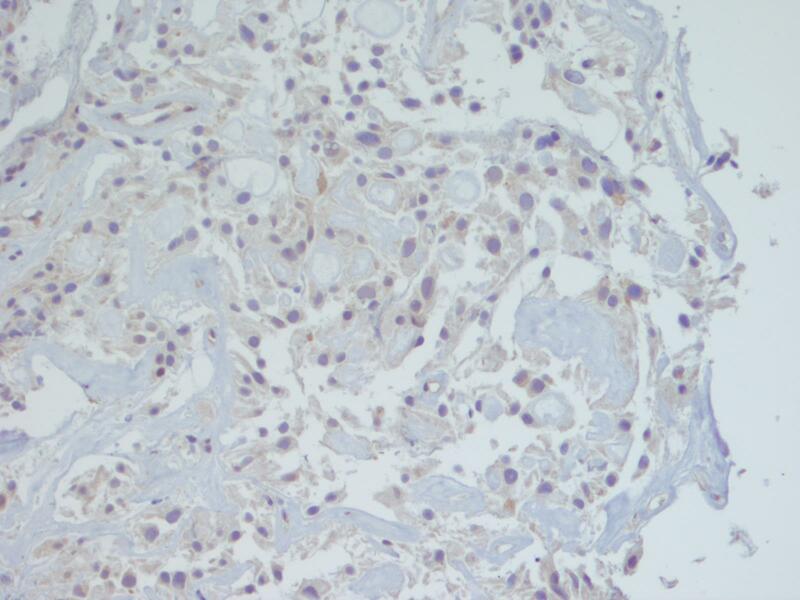 Myxopapillary ependymoma is a rare variant of conventional ependymoma, and is WHO grade 1. It occurs more often in young adults, with a male to female ratio of approximately 2:1. The most frequent site is the sacrococcygeal area, and a common clinical differential diagnosis is chordoma. 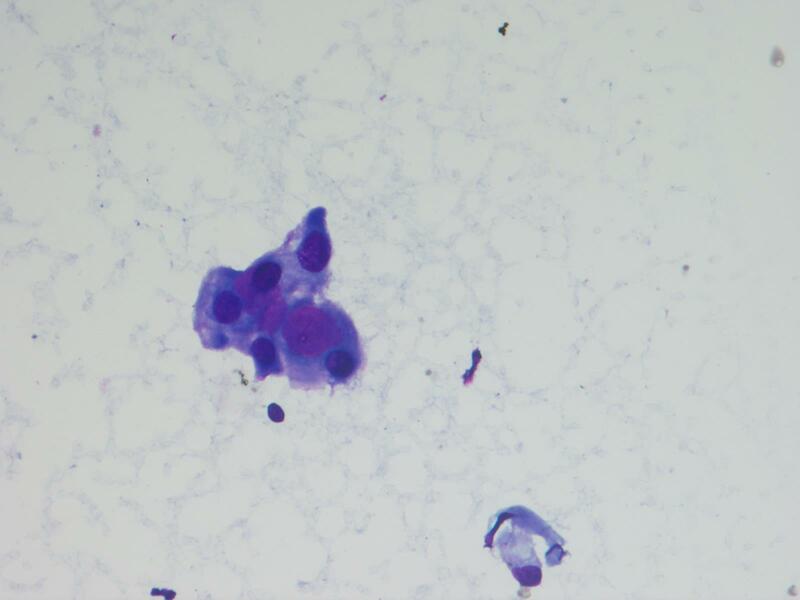 Chordomas, however, have characteristic "physaliphorous cells" - cells with abundant bubbly cytoplasm. 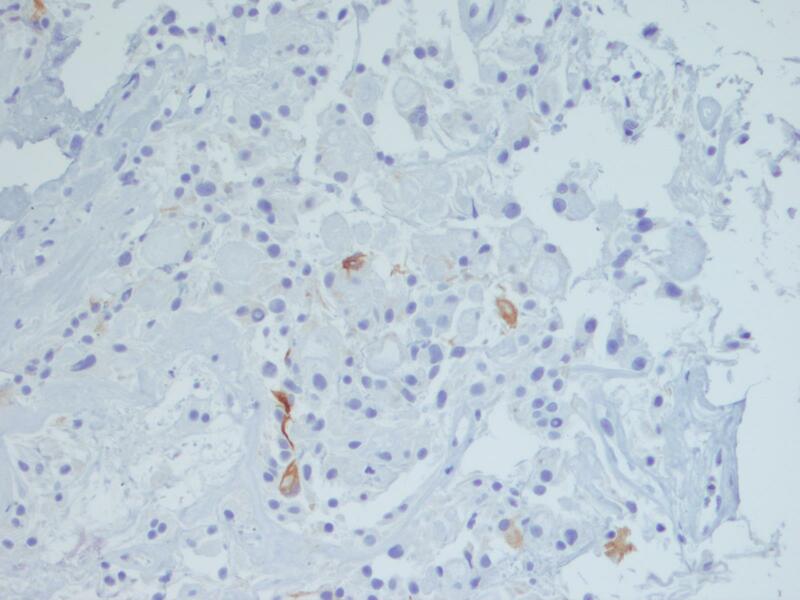 Immunohistochemistry may differentiate these two entities, as myxopapillary ependymoma is positive for GFAP and 50% are positive for S100. 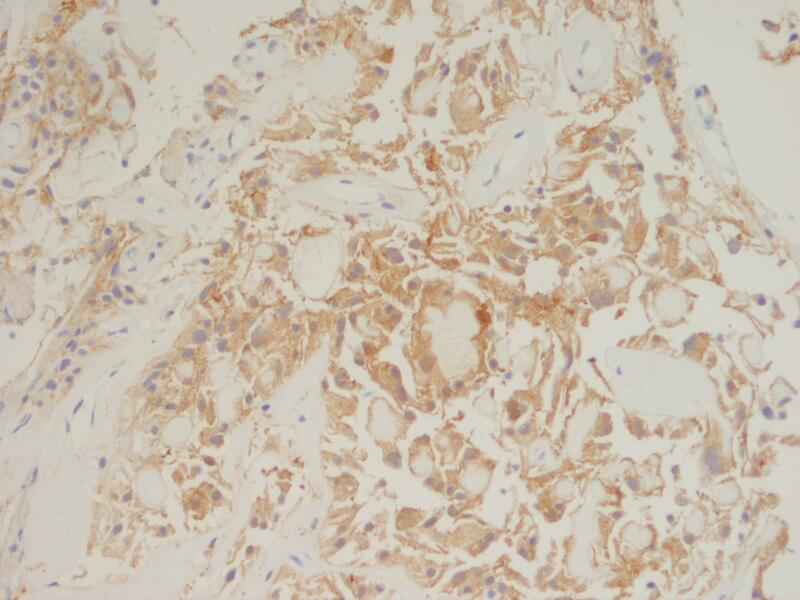 They are negative for cytokeratins (the staining for AE1/AE3 in this case was felt to be aberrant cross-reactivity with GFAP, since both are intermediate filaments - note that the CK OSCAR is essentially negative). 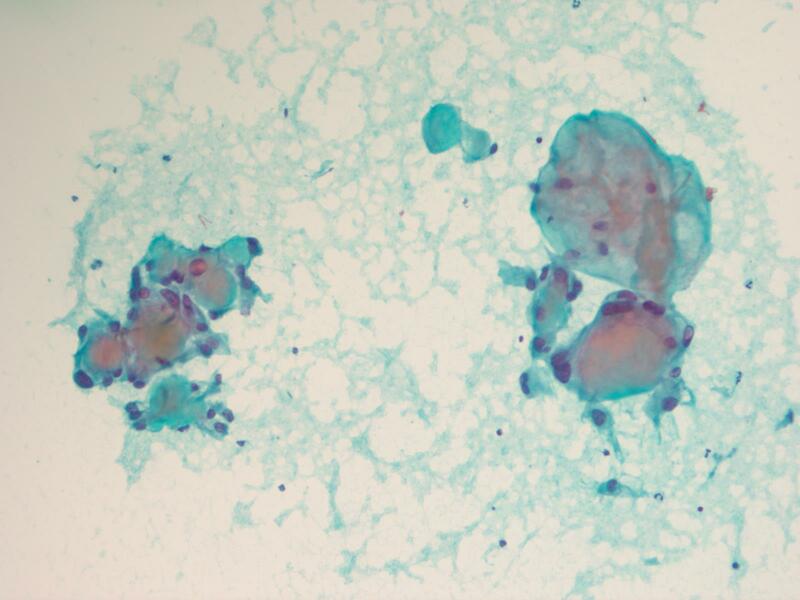 In contrast, chordoma is positive for cytokeratin and has nuclear positivity for brachyury (Demay: The Art & Science of Cytopathology, 2011, 2nd ed, Cibas: Cytology: Diagnostic Principles and Clinical Correlates, 2014, 4th ed, J Cytol 2015;32:42).